The leading data conference in the country recognizes Converseon’s new ConveyAPI™ social media intelligence solution. ConveyAPI is a giant step forward in helping organizations unlock the meaningful insights needed by organizations that can help change their business and their industry. 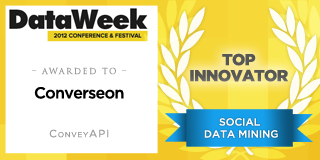 Converseon, the leading social strategy and technology company, today announced that its new ConveyAPI™ social listening intelligence solution has been named Top Innovator in the Social Media Data Mining category by DataWeek. DataWeek, which hosts the Data 2.0 Conference 2011 and the Data 2.0 Summit 2012 -- the largest data-centric conference and festival in the nation -- will recognize this year’s winners during their September 22-27 San Francisco conference. ConveyAPI, available through Converseon’s proprietary applications and via a high performance REST web service for customers and partners, was recognized by DataWeek for its innovative ability to combine the speed, processing capacity and scalability of data software with near human level of accuracy, understanding and analysis. ConveyAPI was built on the recognition that many of the basic first generation “word-spotting” and “off-the-shelf” natural language processing approaches toward social listening have not been sufficient for brands and organizations looking for meaningful, accurate, and actionable insights within the often complex social media conversations that include significant amounts of sarcasm, irrelevant information, slang, and implicit meanings. ConveyAPI solves this problem by utilizing Converseon’s large proprietary database of human coded records of over 50,000 brands in conjunction with advanced machine learning and natural language processing to attain near-human level analysis at scale. The analysis includes sentiment, emotion, intensity, relevance, and the ability to rapidly create custom classifiers to solve specific business needs. Tests of ConveyAPI’s sentiment coding solution show the program approximated 90-95% of human performance. ConveyAPI is the result of nearly three years of research and development by Converseon’s team of leading data scientists, including Dr. Philip Resnik of the University of Maryland, and Dr. Jason Baldridge, professor at University of Texas, Austin and Co-Founder of the OpenNLP project. “The industry has, to date, just scratched the surface of the potential of social intelligence,” said Rob Key, CEO of Converseon. “ConveyAPI is a giant step forward in helping organizations unlock the meaningful insights needed by organizations that can help change their business and their industry. For the first time, our customers and partners can enjoy the benefits of human level quality analysis of social conversation data on a cost-effective and previously unprecedented scale. We appreciate DataWeek’s recognition.” For more detail visit developer.conveyapi.com or follow twitter.com/conveyapi. Converseon is a leading independent full service social analytics and consulting agency that helps brands harness the power of social media to meet business objectives. Combining the best of automated and human analysis, Converseon’s Conversation Miner™ social listening platformis utilized by a wide range of leading brands to help map, monitor and understand the vast social media conversation. Converseon was also recently recognized as a “Strong Performer” in a recent independent report by Forrester Research: "The Forrester Wave™: Listening Platforms, Q2 2012.” Headquartered in New York, Converseon’s team extends to Detroit, San Francisco, Austin, and Copenhagen. For additional information please contact Converseon at info(at)converseon(dot)com or learn more about Converseon at converseon.com, twitter.com/converseon or blog.converseon.com.